Samsung dominates the market with high-quality SSDs. Although the bandwidth of the SATA III protocol has now been exhausted and significant speed increases are no longer possible, development is not standing still here. Samsung still improves the offered SATA SSDs inpPuncto energy efficiency, storage density and lifetime. 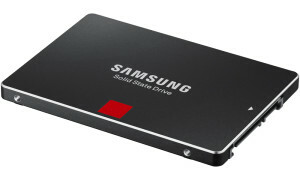 With the Series 860, in the EVO & Pro version, Samsung has presented the next generation of its popular SSDs. The new 860 EVO/Pro and its predecessor 850 have quite similar performance values for reading and writing. Nevertheless, the prices differ considerably in some cases. Therefore, the legitimate question arises: How does this price difference come about and which SSD should I buy for my application? The price difference is justified mainly in the memory type used and the associated (minimum) service life. In NAND flash memory of home users SSD, a distinction is made between MLC (Multi-Level Cell), TLC (triple-level cell) and their stacking in multiple layers in the form of 3D VNAND. The Samsung EVO series is aimed at the upper mainstream customer and offers very good performance at a lower price compared to the Pro series. In the 850 Samsung uses vertical 3D NAND memory. In contrast to its big brother (850 Pro), EVO does not use MLC memory cells, but cheaper TLC memory cells, which are stacked in 32 layers. This triple-level cell flash (TLC) can store 3 bits per cell, which makes it cheaper compared to MLC memory (with only 2 bits per cell), but it is also slower and the wear of TLC flash cells is slightly higher. However, the 3D-VNAND version also significantly increases the service life and robustness of TLC memory cells. To minimize the performance disadvantages of TLC memory cells, Samsung uses a buffer memory (TurboWrite cache) for the EVO. As long as this cache can be written, the EVO achieves a similar performance as the Samsung Pro series. However, if this cache is full, this puts a lot of pressure on performance. In everyday life, however, most files are rarely several GB in size, so the TurboWrite cache can always intercept everything. The 120/250/500GB versions of the 850 EVO use the Samsung MGX controller, the 1TB and 2TB models use the 3-core MEX controller of the 850 Pro. The MGX controller has only two instead of three cores, which are clocked with 400 MHz just like the cores of the MEX. Both controllers promise improved energy efficiency. The guaranteed writing performance for the smaller models (120/250GB) is 75TB Written. For the 850 EVO from the storage size 500GB and beyond, Samsung even promises a write performance of 150 TB Written (TBW) – the same as with the 850 Pro, but with only 5 years warranty. In the home user area, the 850 EVO thus survives the service life of most PCs. Until it was replaced by its successor, the 860 Pro, the Samsung 850 Pro was, so to speak, the royal class in the field of home user SSDs. The memory and long-term performance of the 850 Pro are particularly noteworthy. In its predecessor model (840 Pro), Samsung used normal MLC flash memory. This was replaced by so-called 3D-VNAND (MLC) flash memory. In contrast to the flat structures of the MLC memory, the third dimension is also used and the memory cells are stacked on top of each other in 32 layers. This means that more memory cells can be accommodated on a smaller area. These can be larger and thus ensure a significantly longer service life in terms of writing power (TBW). Other features of the 3D-VNAND include lower energy consumption and higher writing speeds. The memory cells are read and written by the Samsung 3-Core MEX Controller. Another highlight that distinguishes the 850 Pro from all other SSDs on the market is the 10-year manufacturer’s warranty. According to Samsung, the individual cells of 3D-V-NAND tolerate particularly many write cycles. The guaranteed write performance depends on capacity and is 150 TB Written (128GB/256GB) for the smaller models and rises to a remarkable 600TB Written (4TB model). This means that the 850 Pro survives in practice the period of use of almost every PC or notebook. Samsung therefore gives a self-confident 10-year warranty on the 850 Pro Series. The warranty expires, whichever comes first. In the long-term test of heise.de the 850 Pro with 256 GByte only gave up after more than 9 PByte written data. In an average 40 GByte office day, this corresponds to a theoretical term of a good 623 years. The Samsung 860 series has been on the market since January 2018 and is the successor to the 850 EVO. It uses the revised MJX controller and Samsung relies on current V-NAND v4 with 64 layers. However, as with the 850 EVO, the MLC memory cells are reserved for the Pro version and the 860 EVO uses the cheaper TLC memory cells. This 3-bit triple-level cell flash (TLC) is generally slightly slower than 2-bit MLC memory. Wear is also slightly higher compared to MLC flash cells. However, the VNAND version of the TLC cells largely compensates for these disadvantages in terms of service life and robustness. Like its predecessor, the 860 EVO uses an SLC (TurboWrite Cache) to compensate for the performance disadvantages of the TLC memory. Turbowrite capacity is dynamic, so it can be expanded according to demand and available residual capacity, which is why Samsung Turbowrite now calls it “intelligent”. This gives it a similar performance to the Samsung Pro series. Provided this cache is not full due to huge files. Then the write rate drops to a measly 300 MB per second, especially with the smaller models (250 & 500GB). In everyday private life, however, the cache seldom reaches its performance limits. Overall, a speed difference to the predecessor model 850 EVO is almost undetectable. The performance of current SATA SSDs is almost always limited by the Sata 6 GBit/s interface. The durability of the 860 series has increased significantly, which is twice to four times as high as that of its predecessor. Samsung guarantees writing performance for the 860 EVO between 150TB Written (250GB model) and 2400TB Written (4TB model) with a 5-year warranty. 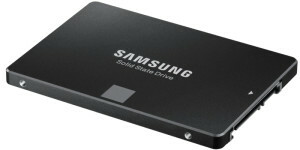 Samsung’s new flagship SOHO SSD is the 860 Pro in memory sizes from 250GB – 4TB. As with the previous models, the Pro version of the 860 differs primarily in its higher quality flash memory and durability. The Samsung 860 Pro uses MLC-NAND with 2 bits per cell, while the 860 Evo uses the cheaper TLC-NAND with 3 bits per cell. This also explains the price difference between EVO and Pro. The new VNAND v4 MLC flash memory is now layered in 64 layers and somewhat more efficient than its predecessor. This is achieved by operating the storage cells with a voltage of 2.5 volts instead of 3.3 volts. The memory is controlled by the Samsung 3-Core MJX Controller. This is the first time Samsung has used the same controller with the EVO and Pro. As with the EVO series, a speed difference to the predecessor model 850 Pro is almost undetectable. The performance of current SATA SSDs is almost always limited by the Sata 6 GBit/s interface. The big difference to the 850 Pro is therefore the significantly increased durability with a shorter warranty period. The durability has dramatically increased and the guaranteed TBW (Terabytes Written) is twice to eight times higher than 850. 300TB Written (256GB model) and exorbitant 4800TB Written (4TB model) write performance is guaranteed for the SSD of the 860 Pro series, depending on the capacity of the SSD. This means that the point of criticism regarding service life, which is still often appropriate in some cases, is finally history. If you look at the long term test of the previous model, new records can be expected for the 860 Pro. The only downer is Samsung’s warranty period. While the previous 850 Pro still had a self-confident 10 years, the 860 Pro has now been reduced to 5 years and is therefore identical to the 860 EVO. The guarantee expires if one of the two limits (TBW or 5 years) is reached. For private users, this is almost always the annual limit.